Graduates of MIT’s Department of Aeronautics and Astronautics learn lots about lift, aerodynamics, and rocket engines. But they don’t learn how to launch and fly a blimp. So when the MIT-educated founders of Altaeros Energies Inc. unpacked a white plastic shroud from the back of a Volkswagen sedan last November and filled it with helium, they didn’t exactly know what they were doing. They’d attached a video camera to their custom-made cylindrical airship, and also a few sensors, to gather information about its motion in the wind. As one of the team members worked a pulley system to allow the blimp to lift off, the team members grinned, scribbled a few notes, and shot video from the ground. Altaeros’s blimp, technically called an “aerostat’’ since it is tethered to the ground rather than free-flying, is designed to hold a wind turbine in its hollow center and fly at nearly 2,000 feet, where the winds are more consistent and powerful. (The wind turbines proposed for the Cape Wind project, by comparison, will reach 440 feet.) A thick mooring cable will carry the electricity generated by the turbine to a ground station. The company’s vision is that airborne wind power will prove an important complement to traditional pole-mounted turbines. Altaeros has already raised several hundred thousand dollars to test its technology and has been meeting with individual investors and venture capital firms to raise more. Based in East Cambridge, Altaeros is one of a half-dozen or so companies around the world working on designs that would send wind turbines high into the sky. While we’ve captured power from the wind for hundreds of years, there are drawbacks to putting a spinning rotor atop a tall pole. “Thirty to 50 percent of the cost of putting up a wind turbine is building the tower,’’ says Altaeros cofounder Adam Rein. And if you try to build a taller tower to harness stronger winds at higher altitudes, construction costs increase further and objections from neighbors get louder. Altaeros believes its aerostat design could produce two to five times as much power as a pole-mounted, 350-foot-tall turbine in the exact location. Initially, the company is developing what you might call “wind power in a box,’’ packing the balloon, helium tanks, rotor, generator, and related gear into a shipping container. The container would then be sent to a remote oil field, island, or military post that would typically rely on a diesel generator for power. Altaeros’s aim is that the aerostat will be flying after just a day of set-up and will only need to descend every three or four months for a helium top-off and a maintenance check. Altaeros is still a few years from commercial production, but it expects the cost of electricity produced by its airborne turbines to compare favorably to a diesel generator, especially if the diesel fuel is being shipped long distances. Several companies are further along than Altaeros in designing flying wind turbines, and have raised substantially more money. California-based Makani Power Inc., cofounded by MIT alum Saul Griffith, has raised at least $15 million from Google and last year received a $3 million grant from the Department of Energy. Makani is building an unmanned aircraft, tethered to the ground, that will fly in large circles. Three rotors on the craft’s wing help lift it into the sky, acting as propellers. Once aloft, the rotors will generate power as the wing swoops through the air like a kite. A Canadian company, Magenn Power Inc., says it expects to begin selling its first-generation, helium-filled system this year. Unlike Altaeros’s design, the entire balloon is intended to generate electricity by spinning in the wind horizontally, similar to a waterwheel. A Magenn system capable of cranking out 100 kilowatts — enough to power 30 to 50 homes — will cost about $500,000. Altaeros plans to have a new prototype of its aerostat ready for testing this summer. 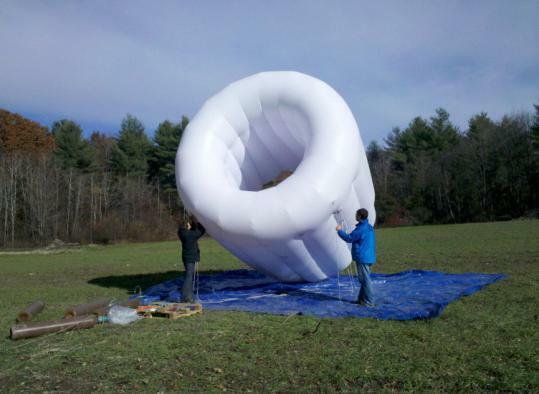 Unlike the hollow-centered blimp lofted last November, this one will have a small wind turbine inside, capable of producing 2.5 kilowatts of electricity — about the size of a “backyard’’ turbine that would supply power to a single-family residence. Using what they learned from last fall’s flights, the company’s engineers have been tweaking the design to make it more stable. The less it is buffeted about, the more efficient it will be at wringing power from the wind. That would be bad news, of course, but what if we had decided to ban cars because of the risk that they’d crash into things? We need technology, even if it seems clunky or dangerous at first, to take us onward and upward. Correction: Because of a reporting error, an earlier version of this column included the wrong title for Adam Rein of Altaeros Energies. He is a cofounder.